The John W. Engeman Theater at Northport is thrilled to present the classic tale of SNOW WHITE AND THE SEVEN DWARFS! 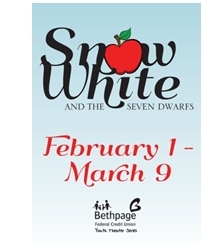 This adored fairy tale is part of the Bethpage Federal Credit Union Youth Theater Series and will run February 1st through March 9th. The tale we love, plus a few new twists and turns, is brought to life in this marvelous musical adaptation. Come meet the beautiful Princess Snow White, the prince, the evil queen and, of course, the seven mischievous dwarfs! Following the traditional storyline, the story of SNOW WHITE AND THE SEVEN DWARFS is brought to life with an eclectic score of toe-tapping tunes. SNOW WHITE AND THE SEVEN DWARFS will play the following performance schedule: Saturdays at 11:00am and Sundays at 10:30am February 1 through March 9, 2014. Tickets are NOW ON SALE and are $15. Tickets may be purchased by calling (631) 261-2900, by visiting www.engemantheater.com, or at The John W. Engeman Theater Box Office at 250 Main Street, Northport. Visa, MasterCard, Discover and American Express accepted. The John W. Engeman Theater at Northport is Long Island’s only year round professional theater company, casting our actors from the Broadway talent pool. From curb to curtain, we have made it our business to provide affordable, Quality Theater in an elegant one-of-a-kind location with outstanding facilities and extraordinary service. The renovated Theater offers stadium-style seating, state-of-the-art lighting and sound, a full orchestra pit, and a classic wood-paneled piano lounge. For a complete show schedule and more information contact the theater directly at 631-261-2900, visit the box office at 250 Main Street, Northport or visit www.EngemanTheater.com.